A unique, effective Anti-Microbial treatment for natural or artificial nails that will not wash off! Provides long wearing treatment and protects the nail plate with a long-lasting zone of inhibition. Contains germ killing Triclosan, safe, stable, long shelf life, and non-toxic. FDA registered National Drug Code (NDC). No Formaldehyde and No Toluene. For natural or artificial nails. Ridgefiller, fast drying, non-yellowing, and maintains the pH of the nail. Protects nails from chipping, peeling, and staining. Holds polish on better and longer. Also great for Pedicures. No Formaldehyde and No Toluene. Contains finely ground quartz crystals that work very effectively to not only fill ridges in the nail plate, but also help disguise nail imperfections. Seche Base has an incomparable bonding ability and is specially formulated to give Seche Vite the best anchor to hold onto. Apply to properly prepared nail plate. The first truly non-yellowing base coat for nail polish. A clear base coat that will not yellow and will adhere to the natural nail. This formaldehyde, toluene, and PB free base coat dries to a clear, hard finish with long lasting shine. Polish will not chip or peel. 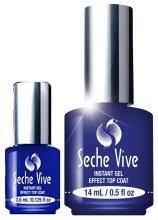 Moisturize and soften dry, cracked cuticles with Seche Condition. Instantly absorb a powerful infusion of Keratin protein, Jojoba and Almond Oils plus Vitamin E in one simple swipe. This undetectably light moisturizing cuticle oil replenishes without the residue. Daily use keeps cuticles smooth, hydrated and nails looking healthy and strong. 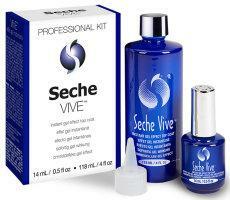 Seche REBUILD helps weak, thin, soft, or peeling nails. This unique protein formulation seals the layers of the nail together. With each application, REBUILD reinforces and thickens nails providing durability while promoting strength and flexibility. Natural nail whitener and strengthener. Use regularly as a top coat to take the yellow out of natural nails. 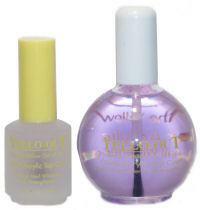 Also can be used as base coat to prevent natural nails from turning yellow from repeated use of colored nail polish. Prevent yellowing from nicotine stains and tanning beds. Also keeps acrylic nails white. Super fast drying top coat dries nails in 45 seconds. Won't chip, non-yellowing. Use over any polish. Genuine inm top coat! Nail Tek Quicken is an ultra-fast drying top coat especially formulated for natural nails. This unique formulation sets polish faster and provide high gloss without sacrificing polish retention. Quicken stops chipping and gets you out of the house or salon fast! Fast drying topcoat, dries to touch in 1 minute and thoroughly in 5 minutes. Highest Gloss of any products on the market. Will not turn yellow, even in tanning beds. Two UV inhibitors and chip resistant. No Formaldehyde, No Toluene, and No Nitrocellulose. Instant gel effect top coat. High-gloss, long wear formula, gel-like plumping effects, and no UV/LED light needed. Its patented formula allows it to penetrate through the nail lacquer to the base coat forming a single solid coating over the nail plate for a much more durable finish which is guaranteed not to yellow. Seche Vite is unmatched as a top coat leaving the nail silky feeling, stronger, more durable, absolutely will not chip and creates the highest gloss of any product on the market today. 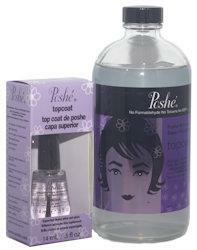 The only polish top coat that can be used on artificial, natural nails and over polish. Non-yellowing, built-in sunscreen, and dries to a luster finish. Cure with UV light, manicure light or air dry.